Acer's TravelMate range is designed specifically for business use on the move. Offering wireless broadband access, and performance surpassing its rivals, the Acer TravelMate 4282WLMi (£1,021 inc. VAT) provides ability beyond its business roots. Considering 3G laptops are for getting emails on the move, this isnt the most sleek, or the smallest, of laptops, so perhaps isnt the best choice for frequent travel use. This was further borne out by a battery life of 201 minutes, which is adequate but for such a big machine we would have expected more in the way of usability. An extra battery can be added for £99 (inc. VAT) to double mobile uptime. The bonus of the extra size is a 15.4-inch screen. While the 1280 x 800 pixel resolution is lower than we'd like, there's enough space onscreen for multi-tasking. The lack of a glossy Super-TFT coating also eliminates reflections. 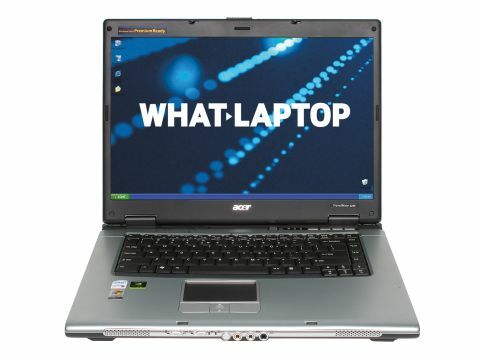 Using an Intel Core 2 Duo processor, this is one of the quickest laptops on the market. All tasks run with speed, even when using multiple applications. Uncommon for a business laptop, 3D power is equally capable. Using a dedicated Nvidia graphics card, gaming is an option, and the Acer could be effectively used for multimedia creation, broadening its business audience. Users can access the internet at broadband speed via an integrated HSDPA module. A Vodafone SIM card is fitted underneath the battery. Its awkward to fit and take out but once installed it is unlikely youll be taking it out again - except for upgrading - so shouldnt prove too much a problem. Vodafone Mobile Connect software is used to manage internet access, and makes connecting to the internet user- friendly. Once connected, web pages can be browsed at broadband speed, making it ideal for downloading and sharing large data files. This is helped by the use of a spacious 120GB hard drive. A recordable DVD drive is also fitted, making the Acer usable as your sole computer. Recording to dual-layer DVDs, up to 8.5GB of data can be saved to each disc. Where the Acer shows weakness is in its usability. While the keyboard is broad and ergonomic, the keys themselves need to be struck hard to register, making it almost impossible to type at speed. Although its strengths outweigh its weaknesses, the Acer TravelMate 4282WLMi is still a mixed bag. For comprehensive power at an affordable price, this is a good choice. However, its poor usability may frustrate users and restricts an otherwise strong laptop.